Below you’ll find some of the main indoor and outdoor venues for entertainment and recreation in the area. To see the big list of events in the NoPho region, see latest In&Out Magazine (PDF downloads here). The region offers an amazing mix of big-city attractions and wide open desert, with several mountains preserved for hiking and a large recreational lake (Lake Pleasant) just 20-40 minutes away from most neighborhoods. Being at the very northern edge of the metro area, North Phoenix is a gateway to Sedona and Flagstaff via I-17. Downtown Phoenix is 30-40 minutes away, and Scottsdale is even closer. Movie theater in a shopping plaza at the southwest corner of I-17 and the Loop 101. Solitude and sweeping views in all directions reward those willing to make a relatively short hike in this 2,922-acre park. Cave Creek Regional Park has more than 11-miles of joint-use trails for hiking, mountain biking and horseback riding. An additional 44 campsites with excellent facilities along with 51 individual picnic sites beckon the whole family. This nearly 1,000-acre park, smack in the middle of the North Phoenix metro area, is a great nearby location for hiking, horseback riding and mountain biking, all just west of I-17. Two hills are crisscrossed by five well maintained trails totaling some 14.5 miles in length. Two trailheads — east and west — provide access. A large community park at the West Trailhead offers a children’s playground, a soccer field and a dog park. In the high desert northeast of Flagstaff, the Grand Falls waterfall roars to life each spring during the annual snowmelt from the slopes of 10,064 foot Mt. Baldy and the White Mountains in Arizona and New Mexico. These falls are also known as the Chocolate Falls because of the brownish color of the cascading water. The turbulent rush of water falls downward some 185 feet — more than the drop of Niagara Falls. On the south side of Happy Valley Road and no more than 20 minutes from most North Phoenix neighborhoods, you'll find Barnes & Noble, Lowes, Wal-Mart and numerous restaurants and retail outlets. Movie theater in the Norterra shopping center at the northeast corner of Happy Valley Road and I-17. People around the country were shocked and saddened in late June 2013, when a raging wildfire near Yarnell killed 19 Prescott-area firefighters. The state has memorialized the fallen with the 320-acre Granite Mountain Hotshot Memorial State Park, which opened Nov. 30, 2016. One of eleven regional parks in the Maricopa County Park system, Lake Pleasant Regional Park is the only one with a lake — the second largest lake in Arizona. There are two marinas serving as launch points for a full range of water sports, from boating, sailing and skiing to fishing or kayaking. Plus there are several trails for hiking, mountain biking and horseback riding. For resident in the North Phoenix area this nearby water paradise — just 20 minutes off I-17 — has become a Sonoran Desert treasure. Non-profit group develops youth and adults within the field of performing arts while enhancing their intrinsic creativity and brokering their vast talents. MTA regularly puts on performances in Anthem. It trains and educates youth so they can become the artists, patrons, and leaders of tomorrow while providing opportunities to adults to empower them and foster their creativity. All youth who audition are cast. Performances are at various venues, including schools and churches. This non-profit organization serves the greater Phoenix North Valley by building community through musical performance and education, while enhancing music appreciation through artistically engaging concert experiences for audiences of all ages, and providing multi-generational musicians a place to enjoy the collective art of making music. NVSO also supports two youth orchestras: one for high schoolers, one for middle-schoolers. Just off I-17 at the very north edge of Phoenix, you'll find everything you expect from an outlet mall. Among the retail outlets: Gap, North Face, Vans, Michael Kors, BOSE, Calvin Klein. This expansive preserve spans 21,500 acres — more than 33 square miles — of undisturbed desert mountains, washes and plains that wind through and around several communities in North Phoenix. There are some 34 miles of well maintained trails, with three separate trailheads around the Valley, for hiking, mountain biking and horseback riding. The Pioneer Living History Museum's more than 30 buildings recreate the historical culture of a 19th Century Arizona frontier town, right here in North Phoenix. The buildings, both original and historically accurate reproductions, are scattered across the 90-acre site, inviting visitors of all ages to interact with and experience the daily challenges and joys of living on the desert more than a century ago. Founded in 2003, ProMusica Arizona (PMAZ) aims to enrich lives in the greater Phoenix area, with focus on the North Valley, through innovative, joint performances of its multigenerational chorale and orchestra. The non-profit organization has more than 100 musicians and singers. Performances are held at various venues, including the Orpheum Theatre, Herberger Theater Center, Scottsdale Center for the Performing Arts, Camelback Bible Church, American Lutheran Church of Sun City and Boulder Creek Performing Arts Center. The Pueblo Grande Museum site, originally built and occupied by the ancient Hohokam people between A.D.100 and 1450, and owned by the City of Phoenix since 1924, is the largest preserved archeological site in the Valley. This bustling shopping district, with a "main street" of sorts, is conveniently located just off the I-17 on the north side of Happy Valley Road. You'll find Harkins Theatre, Best Buy, P.F. Changs and several other restaurants, plus numerous other small and large retail stores. A non-profit organization dedicated to advancing art, artists and art education. With more than 650 members, the League organizes programs and events around the North Valley for people of all ages, experience and interests, believing that artistic awareness is essential to the well-being of life and community. 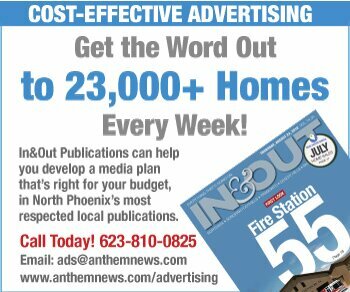 Based in Cave Creek but cooperates with other communities, including Anthem, for events. This non-profit community theater is dedicated to providing live theater to entertain and enrich the community and encourage youth and adult participation by providing growth and educational opportunities through a variety of theatrical experiences, both on and off stage. Wet ’n’ Wild lays claim to being the largest theme park in Arizona. It has everything you'd expect in a water park: waterslides, waterslides for giant inner tubes that take the whole family at once, and ... did we say waterslides? There are sections specifically for younger kids, too. Open seasonally.